What to consider when choosing a wedding photographer? 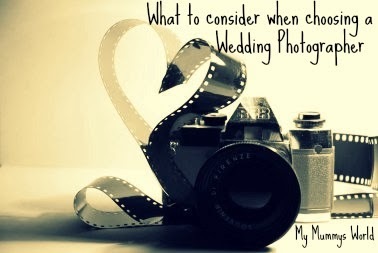 What to consider when choosing a Wedding Photographer. Your wedding photographs are the only item you are left with after your wedding to look back on - unless you have a video too. Therefore choosing the right one for you is possibly one of the most important tasks of wedding planning. When we set our wedding date in my mind I had an idea of the style of photography I wanted and a rough budget, but when it came to looking I could find no photographer I liked which matched both of these targets. Ok, there was the style and price I wanted but not all the goodies I wanted with it. So therefore I have complied a post on what to consider when looking for a photographer. Firstly, you need to have your date and venue chosen, of course you can look at photographers before this point but most get booked up months or years in advance. Of course, you can still talk to your photographers before this point but nothing can be set until a date is given. Secondly, you should choose your style - how do you want your photos to turn out, do you want to be posed all day? This is one of the major things I learnt, photography style is a lot more important than price! The image style is what you will be left with, not the money that is quickly escaping your pocket as your plans explode. In years to come when you are looking back on your wedding, with your children or their children, you don't want to wish you had better photographs. In polls undertaken, one thing most brides regret not spending extra money on is their wedding photography. Next, you need to choose your style of photography, how do you want your pictures to roughly look. This is one thing I knew instantly the moment we set a date, in fact the moment we got engaged. There are three styles of photography traditional, documentary or fashion/fine art. Traditional photography is as it says- the traditional style. These are your posed photographs, in general you will be asked to pose for more-or-less every photograph on your day. If you want to ensure how you will look for each photograph this is the style you should opt for. Documentary photography, this style is given many name reportage, candid or photojournalistic. This style gives minimal interference from the photographer on the day with most of the shots being caught from the side-lines. This style gives a more natural and realistic account of what happened on the day. Fine art/fashion photography is influenced from high end magazines, the shots taken are more posed such as traditional but with a lot more high editing done afterwards. If you would simply like to look like your wedding belongs in a high end magazine such as Vogue then this is the style for you. Many photographers will use a mix of any of the two above styles. Next, you will need a budget, roughly how much do you want to spend. It is always best to have a rough idea but be flexible to be a little lenient if you find a photographer you like who is just out of your budget. Now I'm sure you don't need me to explain to you what your budget is, but I've listed some information on budget brackets and what you can expect within them. So for around £0-£500 this is described as the budget market, within the price range you can expect to find an inexperienced or new photographer who is looking to build their portfolio. Either that or they are working elsewhere and doing wedding photography as a hobby. For £500-£1000 you could find a photographer with a decent level of experience, but again still may be gaining an income from elsewhere. However, if you find the right style you may be able to find a bargain within the price bracket but be sure to check everything out first. Fora full time wedding photographer you are looking to spend around £1000-£2000. You may find this hard to believe, but photographers charging this amount are usually full time and have their overheads to pay. For this you will receive a good service and good prints. Finally you have £2000+ these are well experience award winnings photographers and generally you would have a name in mind for this budget. A full time wedding photographer can provide more piece of mind as they've been there, done that (so to speak). They should be fully insured and belong to professional bodies so will have standards in which they need to meet. So once you've discovered your style and budget you would like, you then just need to search like crazy to find a range of photographers. These can be found at a variety of places, internet searches, recommendations, social media or wedding fairs. It's always best to look around at different photographers and meet with them to see the style of photography and if you feel at ease when speaking with them. When you found a photographer who you like and is within your budget, when you meet or even before hand it's always best to find out a range of information. Not only does this give you reassurance and information, it will hopefully help you discover the 'cowboy photographers'. When spending all of this money you want to be sure both you and the photographer are on similar terms and know what you are spending your money on. All photographers use their best images on their websites, social media and at fairs. How do you know their clients didn't have useless photographs. Therefore ask the photographer if you are able to see photographs from a full wedding, start to finish. Preferably including the coverage you are looking for, i.e. if you want Bridal Preps, have a look at Bridal Preps. How many weddings have they shot previously? There is no right or wrong answer to this, however its something to consider for pricing brackets. You may find someone who has only shot a handful of weddings may be better than someone who has shot 20 for instance. Again a good reason to look at portfolios. What would happen if your photographer was ill on your wedding day or if their camera or equipment fail? You need to ensure they have back-up plans and not just face it if it happens. Also, if they provide an alternative it is someone of the same standard? Linking to this is if they have insurance? As a customer you can feel safe knowing your photographer has insurance, again giving reassurance. There are 3 different types of insurance. Kit insurance; if their camera breaks, they will get a replacement regardless. Public Liability; this covers everyone encase someone trips of a camera bag or loose wire. Finally, Professional Indemnity; this covers your photographer encase they are sued for not fulfilling their contract. However it still matters to you as if they are sued without this you are left with no photographer. Do they have any references you can view? Now this isn't a necessity but if you have someone claiming to have shot 70 weddings with no testimonials it would make me cautious. On the other hand, if they can produce one for each wedding it may not be a true account of their style if they are pushing for testimonials. When you are paying all of the money on photography you may want to find out what's included within the amount and what hidden extras their are. Each photographer differs, coverage is usually offered in packages such as full/half day or 4/8 hours. Be sure both you and the photographer are certain of start and finish times and what is fitting in within the times. Think of how you want to have your day and what photographic memories you want. Packages - What kind are there and what are the differences? Again each photographer offers different, some offer just photos others offers discs, USBs or photo books. Again each is an option but its worth considering what you want. All I will say is prints or photo books included in packages are generally a lot higher quality. Alongside this its always best to ask how long you will be waiting for your images and other outputs. Most photographers range between 3-6 weeks for edited photos. One thing to note is Copyright on pictures remains with the photographer at all times. In rare instances you can fully buy the copyright to the images. If you are allowed to print the photographs, the photographer is giving you a license. Its always best to check with your photographer how you can use images to ensure your not in breach of contract. Finally, a question a lot may not think of, Will you need to feed your photographer? Some may request this within the contract - its not unusual, others prefer to bring their own whilst others are grateful of being asked. But one thing to consider is, if they are with you all day, they need a rest too.